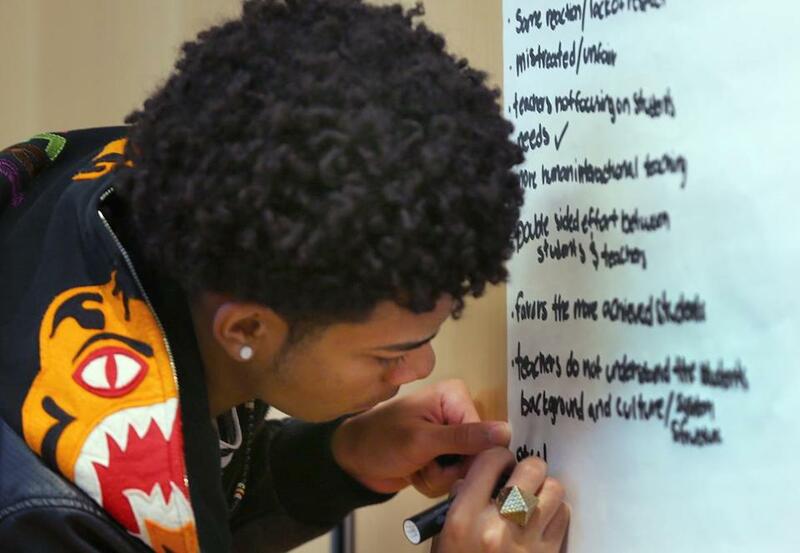 Seventeen young men of color in the Boston Public Schools, along with other students, presented their recommendations to improve the city&apos;s quality of education. For two hours Saturday at the city’s public education headquarters in Dudley Square, officials with impressive titles outlined how Boston public schools struggle to educate black and Latino boys. There were statistics and presentations, remarks and acknowledgments, but when the 60 black and Latino students listening, all boys, were allowed to speak, it was clear they were well acquainted with their school’s failures. Edward Tapia, a 10th-grader from Excel High School in South Boston, thinks the suspension rates for boys like him are unjustly high. Nathaniel McPherson, another 10th-grader at Excel, wishes public schools had teachers who mirrored Boston’s demographics. Dana Martinez, a 10th-grader at Madison Park High School, wondered why Boston schools are so segregated. “It makes you feel left out,” Martinez said. As Tapia, 16, prepares to graduate high school and go on to college, he wondered if his best at a chronically under-performing high school will be good enough come time for college. According to the 2014 Massachusetts School Report Card Overview, Excel is among the lowest-performing 20 percent of schools across the state. “I put all my effort into school, and I know that I could fail even if I do all my work,” Tapia said. The students were convened by Sociedad Latina and the Coalition of Schools Educating Boys of Color, two community organizations that provide educational support services for young men across the city. 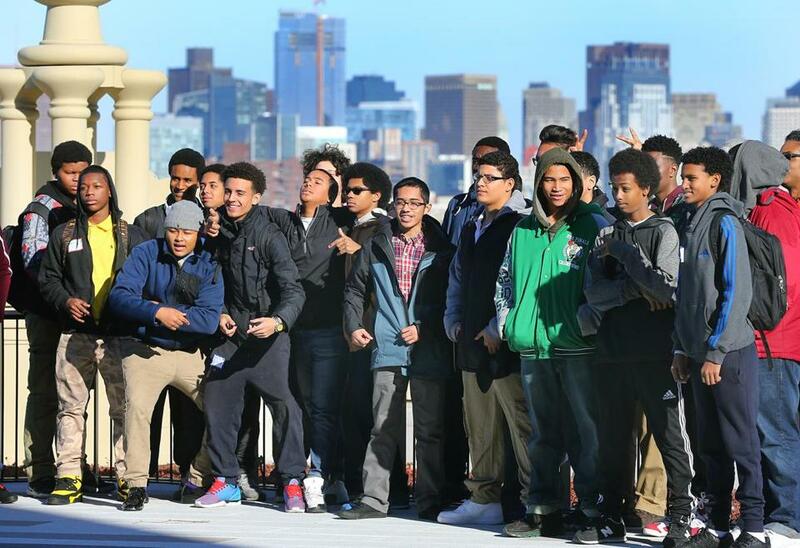 Saturday marked the first of a two-day session designed to give male students a voice in the changes looming over Boston’s public schools. Motivational speakers led chants about having the confidence and excellence of legendary boxer Muhammad Ali in the morning, and held workshops about male empowerment in the afternoon. “What hood do you rep? Brotherhood!” the boys yelled out, during a call and response chant that was repeated throughout the day. Later, the boys crafted recommendations on how to improve Boston public schools, which will be presented to officials on Monday. The recommendations included relaxing disciplinary rules so students would not have to be escorted to the bathroom by an adult or shamed for making a mistake in the classroom, they said. Madison Park students said they were sometimes randomly searched by school security guards. And students also shared their anger over the metal detectors that greet some of the boys upon entry and made them feel like criminals, they said. Others asked for remodeled buildings or new textbooks. Some of the boys in attendance Saturday will form an advisory council, which will be overseen by the city school district and its superintendent, Tommy Chang. Chang spoke to the boys at the outset of the conference and called educational equity a critical civil rights issue. “We have some important work to do and we’re going to need youth to stand in front,” he said. One district-wide initiative Chang proposed was expanding the advanced work class to more students in Boston. The class, typically called AWC, is a program that allows students to test into an accelerated curriculum in grades 4 through 6. The program acts as a gateway into the exam schools, but few black and Latino boys are enrolled in it. Chang hopes to raise the level of every elementary classroom and eliminate the two-track system. Rosann Tung, who has researched Boston public schools at Annenberg Institute for School Reform at Brown University, presented her findings to the group. “What I am about to show you will make you mad,” Tung said. According to Tung’s report, just 22.1 percent of black males and 24.9 percent of Latino males in Boston scored proficient or higher on the English MCAS exams in elementary school, compared with 56.9 percent for white males and 48.5 percent for Asian males in the city. Some boys in the audience said it was hard to hear such grim statistics about their schools, which many see as a home away from home. But throughout the day, when many such statistics were aired, the boys and their mentors came back to the message of Ali. Life is a fight, they said, and you must knock out the challenges. To build on the words of the former heavyweight champion: read like a butterfly, study like a bee. Rumble, young men, rumble.